In 2018 we will be able to experience the start of a new League of Legends era with Week 1 of the NA LCS 2018 Spring Split where the North American top league will shine in new brilliance. Building on the format changes of the NA LCS with the new franchising system introduced four new teams entered the Olympus of the most important LoL league in this prestigious region. In addition to the teams, the participating players were also mixed up and quite a few former stars of the European LCS are now spending their professional League of Legends future in North America. According to some League of Legends experts this year's favourites for winning the Spring Split will be the North American bedrocks and fan favourites Team SoloMid and Team Liquid, both teams witnessed some strong roster overhauls with TSM binding the maybe best Western botlane to their squad. After the All-Star 2017 tournament failed to appease the fan's expectations with its strange format the next international competition for the participating teams will be the 2018 Mid-Season Invitational tournament. You may also take a look at the full schedule of the 2018 NA LCS Spring Split which will start on January, 20th with the clash between Team SoloMid and Team Liquid. Don't miss turning in for more exciting action on Summoner's Rift! The new franchising system of the North American league seems to have filled the pockets of the League of Legends teams with a lot of money and a large number of new faces will be participate in the NA LCS Spring Split 2018. Team SoloMid and Team Liquid in particular are considered to be the clear contenders for the title of the LCS crown but the new teams are also bringing considerable momentum to the prestigious league. In addition to the duel of the favourites, the clash between the North American powerhouses Counter Logic Gaming and Cloud9 is a real delicacy in Week 1 of the NA LCS Spring Split. No roster changes known for Week 1 of the NA LCS Spring Split 2018. Since the matches of the 2018 North American Spring Split have already been confirmed our renowned online betting providers have already included bets and betting odds for Week 1 of the NA LCS in their repertoire. As always you will find an overview of the most important odds right here but if you want to be really up-to-date you have to take a look at the latest odds on the websites of our recommended LoL betting sites. 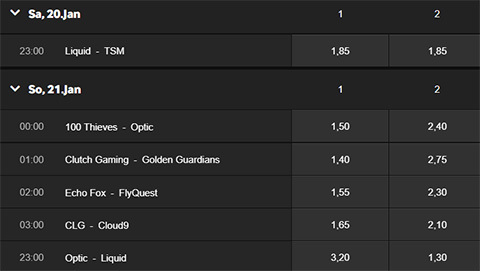 The betting odds listed below are always subject to change, just take a look at our LoL LCS 2018 betting odds site for more information. You will find detailed predictions and analysis of the upcoming matches of the NA LCS Spring Split 2018 – Week 1 right before the first game of the week. One day after the EU LCS, the North American league will also start into the new season. The first match promises to be a duel at the highest level, because Team Liquid meets Team SoloMid. Both teams made some changes to their rosters during the winter break, Team Liquid was able to sign stars such as Impact and Pobelter to become one of the favorites for the Spring Split title. But the match up on the botlane promises to be particularly explosive: Team Liquid's AD-Carry, Doublelift, was playing for TSM until the last split and, according to his own statements, only learned through reddit.com that he was going to be replaced by the European ADC Zven. In an interview he responded fiercly and said that he wants to make sure that “they (the people in charge of TSM) regret the decision”. We can be curious to see whether he can perform well against his former employer's new Botlane, as he will be able to meet the EU LCS serial winners of the past years. But Zven and Mithy aren't the only stars on Team SoloMid's side, Bjergsen is still considered the best Midlaner in the West. At LoL Allstars 2017, he even managed to beat Faker in 1v1, who had previously emphasized his ambition to win the tournament. The big uncertainty factor of the last splits was Jungler Svenskeren. However, he was now replaced by the North American talent Mike “MikeYeung” Yeung. With Xmithie, however, Team Liquid was also able to secure the services of a reliable and experienced jungler, which makes it difficult to attribute an advantage to one of the teams here. The synergies are to a certain extent present in both teams, three of Team Liquid's players played together in the Immortals last year, while TSM Bjergsen and Hauntzer have been playing together for years and Zven and Mithy have been playing together on the Botlane for a long time at G2 too. Prediction: In their first match, both teams want to show that they are a candidate for first place in the table. I expect a match at eye level, but with slight advantages for TSM, especially in the later game, when it comes to big fights and a lot of coordination is needed. I predict a 1-0 victory for Team SoloMid. 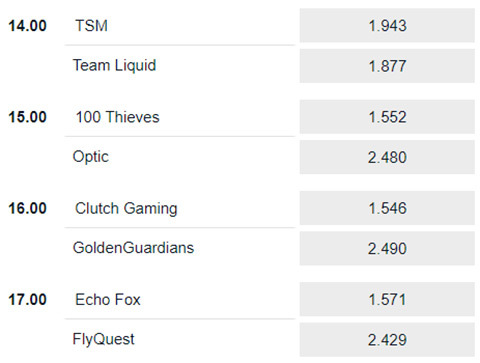 The match between 100 Thieves and OpTic Gaming should be a less even match than the one between Liquid and TSM, but not a less exciting one. Both organizations benefited from the format changes in NA LCS, which resulted in the loss of licenses for some teams and made room for new ones. Both 100 Thieves and OpTic tried to collect the pieces of Phoenix1 and Co. and sign the best players. On paper, it looks as if the 100 Thieves have done a better job here, not only were they able to secure the two Koreans Ssumday and Ryu, but also to lure support Aphromoo away from his long-standing employer CLG, thus signing one of the best North American players to this position. The team is completed by Meteos and Cody Sun, also two players who have been in the NA LCS for many years and have a large fan base. The 100 Thieves in NA LCS can hardly be beaten by experience, even if the oldest LCS player is in the roster of OpTic Gaming with LemonNation. The midlaner from OpTic, PowerOfEvil, is still rather young. Most recently, the German reached the semi-finals of the LoL Worlds 2017 with Misfits GG and only narrowly failed to reach the semi-finals of SK Telecom T1. A total of four players from the Summer Split 2017 Roster of Phoenix1 are playing in the match between 100 Thieves and OpTic Gaming, two of them in each of the team. The goals of the two teams for the upcoming split are very different. For players like Ssumday or Aphromoo, it would be a bitter disappointment not to be among the top three of the NA LCS. A place in the playoffs is the minimum for the 100 Thieves, but for OpTic it would be a huge success. In the first game, this difference will also be very likely to occur as long as the Thieves can deal with the great pressure. Prediction: On the side of the 100 Thieves there are many experienced players who have been active for years without any major interruptions and who have lost none of their quality. For the OpTic Gaming team, it will probably take a few more years to achieve success. I expect a clear 1-0 victory for 100 Thieves. Prediction: According to the bookmakers, the third game of the evening also looks very clear. Clutch gaming is the clear favourite, which is mainly due to the signings of LirA and Febiven. However, I wouldn't readily dismiss the Golden Guardians' team like that, especially on the first day of the match everything is still possible. I expect a balanced game, but ultimately a 1-0 victory for Clutch Gaming. Prediction: Both teams played at NA LCS last year, but experienced a massive rebuilding during the winter break. Especially exciting was the signing of Toplaner Huni by Echo Fox. In October 2017 Huni was in the final of the LoL World Championship with SK Telecom T1. Considering the two rosters, I expect a 1-0 victory for Echo Fox. Prediction: At the end of the match day we get to see two long-established teams. On the CLG side, only one player was changed, on Cloud9 there were two changes. There is no need to expect big changes in playing style compared to the last split, even though Cloud9 lost Toplaner Impact, one of their strongest players in the past season. Jensen and Sneaky are still outstanding players in their positions. I expect a 1-0 victory for Cloud9. Prediction: A broad grin decorated the face of AD-Carry Doublelift when he was asked for a winner's interview on the first day of the NA LCS Spring Split Week 1 after the glorious victory over his previous squad Team SoloMid. Thanks to the new franchising system, Team Liquid has better chances than ever to win the North American LCS. OpTic Gaming shouldn't be a big hurdle on their way to the possible Spring Split crown, I expect Xmithie and his team mates to win the first match of Day 2 – 0-1 victory for Team Liquid. Prediction: The league of stopwatches has only started and Bjergsen and his team mates already suffered a bitter defeat against Team Liquid on Day 1 without any land in sight. The strong pieces of the TSM puzzle haven't clicked yet but against the definitely weaker FlyQuest team they should conquer their first points in order to not slip into the abysses of the lower half of the table after the first week. The much vaunted favourites are still lacking in chemistry but against the FlyQuest team I still expect a 0-1 victory for Team SoloMid. In the clash on the second match day of the week between Counter Logic Gaming and the newcomers of 100 Thieves support player aphromoo meets his old team mates and employers. If you take a look at the renewed roster of Counter Logic Gaming for the Spring Split 2018 you may see some potential: jungler ReignOver finally plays for a strategically experienced team again and could easily return to his top performances of Season 5 when he was playing for Fnatic, Darshan and Huhi are two solid solo laners in the squad of CLG and support player Biofrost is certainly not a downgrade to the outdated aphromoo of the last seasons. With good coaching and an excellent infrastructure the team could be back on top of the standings this season but the road is still long and rocky. The 100 Thieves team of the former Call of Duty player Matthew “Nadeshot” Haag can not only score with a successful merchandising line but also with some veterans of the professional League of Legends eSports scene in this team. With pr0lly as an experienced coach and strong players such as Ssumday and Ryu this team can easily secure a place for the playoffs if they are able to beat the other NA LCS top teams in the upcoming weeks. A big question mark are the mechanical abilities of jungler Meteos but maybe he can compensate his flaws by his many years of experience. But since they already had to go over the full distance in their first match against OpTic Gaming I consider Counter Logic Gaming to be the stronger team. Prediction: The Spring Split 2018 is still in its infancy and the real strength of the new teams and renewed player rosters can only be determined in the upcoming weeks. For this exciting match I expect a 1-0 victory for Counter Logic Gaming. Prediction: The former players of the Cloud9 team have been scattered around the North American LCS and two of them found their way into the Golden Guardians team – Hai and Contractz are playing against their former employers in the fourth game of Day 2. In addition to the long-established and more or less experienced veterans of the North American LCS, the young and eager AD-Carry Deftly also joined the squad. Against the weakened Cloud9 team (compared to their squad of the last season) the Golden Guardians still seem to be inferior, therefore I expect a 0-1 victory for Cloud9. Prediction: Last but not least Echo Fox and Clutch Gaming meet each other on Summoner's Rift at the end of the match day. While the Echo Fox team is underrated by many experts and seems to have a lot of potential the Clutch Gaming quad showed first indications of their brilliance on Day 1 but their real strength is still difficult to estimate. If the Echo Fox team is doing well the strong players have the potential to play at the top of the League of Legends olymp. However, in the event of a series of defeats the atmosphere in the team could quickly turn to bad because of strong personalities such as Huni, Fenix or Dardoch. Clutch Gaming might come out on top but I expect a 1-0 victory for Echo Fox.